Student Design Set Bible Tabs designed for the active disciple and study enthusiast. Fun, styled tabs with complementing foil edges. For Bible sizes from 7"- 12" tall. 84 black foil-edged tabs: Old and New Testament tabs, Catholic tabs, special notation tabs, and a Life Verse tab. Tabs are printed on both sides, come with a quick and easy placement guide and are conveniently packaged in a compact 3.25" x 6.25" package that can hang on a peg or stand on a counter. 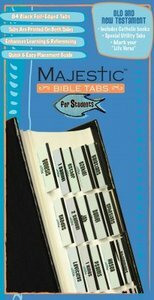 About "Majestic Bible Tabs For Students"